Visitor parking in the Capitol area is limited to either metered street spaces or designated lots. The City of Tallahassee manages two parking garages (Kleman Plaza and Eastside Parking Garage) and one surface lot (near Duval and Gaines). The Department of Management Services (DMS) manages two lots (Lot E and Lot 4). 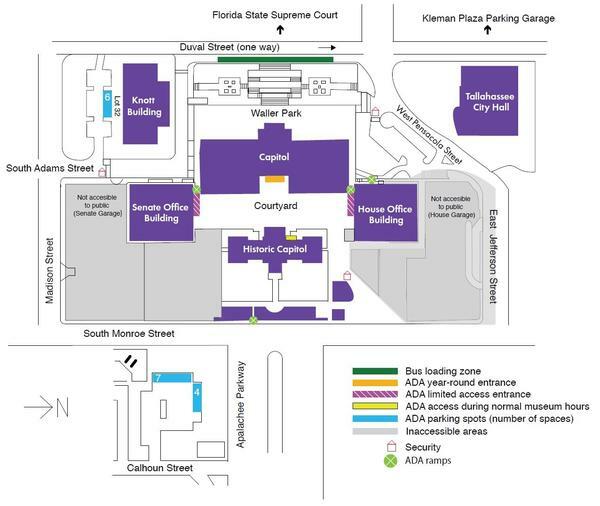 Spaces for visitors with disabilities are located on the west side of the House Office Building in the north side loading zone. There are more spaces located in the parking lot south of the Knott Building. If you're parking outside these lots in a non-metered spot, please ensure that the spot is marked for visitor parking. Cars parked in employee spaces will be towed. Kleman Plaza is an underground garage located northwest of the Capitol. Entrances are located on Duval Street and Bronough Street. The Eastside Parking Garage is located on Calhoun Street, and he entrance is on Calhoun Street. 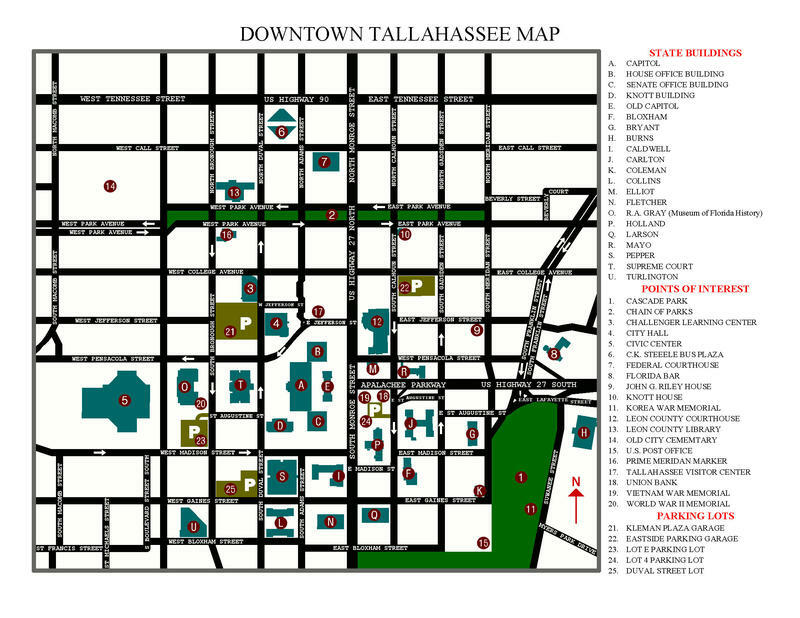 Cost information for city-owned parking facilities can found on the City of Tallahassee's website. Lot E is located off Borough Street, adjacent to the Museum of Florida History. Lot 4 is located behind the Vietnam Veterans Memorial off Calhoun Street. Information on lot charges and the locations of other lots near additional state government buildings is located on the DMS website. The Bus Loading Zone is located on the right curb of Duval Street, in front of the Capitol. The Loading Zone is for loading and unloading only and is available on a first-come, first-serve basis. Double parking is prohibited. Buses should never be left unattended. An unmanned bus will be ticketed and/or towed.